Today is the last day of widespread extreme cold stretching from the Midwest through the Northeast, although some minimums will remain dangerously cold in the area Saturday morning. I’m estimating that somewhere between 500 to 1000 record lows were set in association with this Arctic outbreak the last few days of January. You may ask, how can record cold temperatures be related to climate change? Trying to answer this question scientifically is on the cutting edge of new research I must admit, but I’ll give this my best shot using some recently posted articles. The frigid temperatures are caused by a mass of cold air that leaked from the polar vortex in the Arctic Circle. The polar vortex is an area of cold, low-pressure air that swirls in the stratosphere above Earth’s North and South poles. When it’s strong, the polar vortex swirls in a regular pattern above the Arctic Circle, contained in part by a strong jet stream that keeps the cold air up north and the warm air down south. 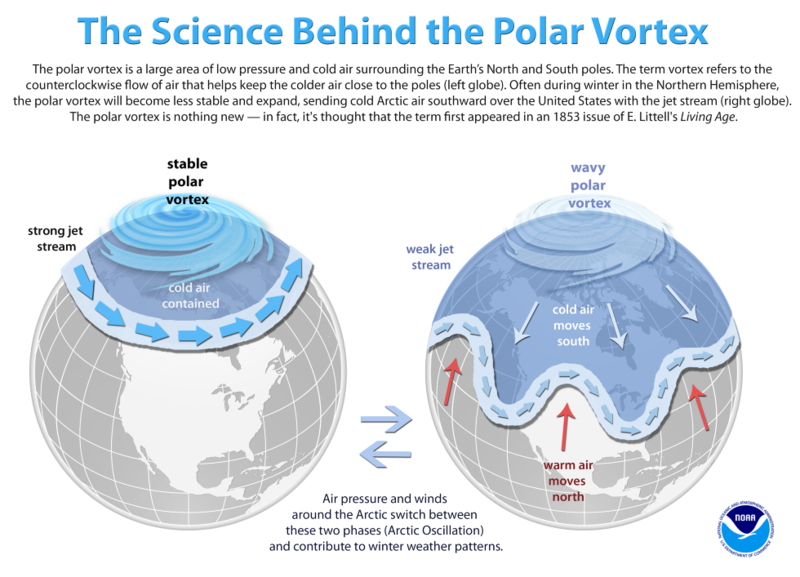 But sometimes the winds that power the polar vortex weaken, resulting in a destabilized jet stream that shoots cold air to the south – what’s known as a polar vortex event. Although the polar vortex isn’t new, scientists still aren’t exactly sure what factors destabilize it and cause these extreme weather events. In recent years, however, some climate scientists have suggested that global warming might be causing disruptions above the Arctic. In my experience since the 1990s via my surface record research instances of record cold are diminishing across the planet contrary to what you might see in some articles written this week. Yes, I get that the jet stream is being affected by carbon pollution producing weird looking undulations and gyrations, but are polar vortex lobes increasing the number of record lows and the duration of cold outbreaks? Yes, since the turn of the century we are seeing more of these closed lows at fairly low latitudes, but are these temporarily putting a halt to global warming overall? I think not. Of course, as long as I am able, I’ll keep tabs statistically on how climate change in association with extreme cold goes. Is that an assignment Professor?